Pakistan on Thursday went on to beat New Zealand at Hamilton to clinch their first ODI series victory in 17 years by 41 runs. Last time they had won in New Zealand was back in 1994. With this makes their first ODI victory since November 2008, that coming against the West Indies. 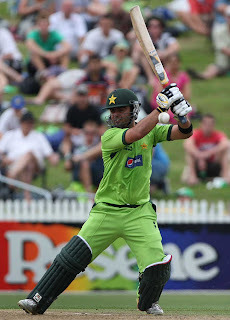 Ahmed Shahzad was the star of the game, as we went on to score his maiden century , to take the game away from the Kiwis. Shahzad made an impressive 115 from just 109 balls smashing 3 sixes in his magnificent innings, giving the New Zealand bowlers no answer to his supreme display of batting. New Zealand after the dismissal of Shahzad took things back into grasp taking some quick wickets, hence hindering the progress been made and went on to manage 268-9 . New Zealand started off with a shocker as, Jesse Ryder on whom the eyes were focused to give some glimmer of hope , got run out on a direct hit from Misbah Ul Haq. After the dismissal of How, Guptill and Captain Taylor took the reins , and brought their innings to stablility , both scoring half centuries. But at the end , none of their valiant innings were of substance as Pakistani bowlers came on to dent the Kiwi progress. Oram and Nathan Mc Cullum brought some resistance, but they were soon to be undone and got bundled at 227 . Wahab Riaz was the pick of the bowler who took 3 wickets and , Shahid Afridi and Umar Gul took 2 crucial wickets to ensure that Pakistan saw home with series win. "We have won after a long time, and it is good coming before the World Cup. What a talent Shehzad is! I thought 300+ was on, but the wicket was slow in the middle with the old ball. Hafeez is the best allrounder in my team, he's done very well in recent times... All the fast bowlers did well. The first run out by Misbah was really good." With Shahid Afridi's good run as captain in this series, will make him a serious contender for captaincy at the World Cup 2011 starting later this month.